Immediate Ice Melting Results that will amaze you! Push the button and watch the ice melt away in seconds! Eliminate back breaking chipping of dangerous icy patches and prevent slips and falls. Get rid of hard packed snow & ice quickly and easily. The Bare Blaster is made of nickel plated steel and brass to withstand the elements. It weighs under 4 lbs. 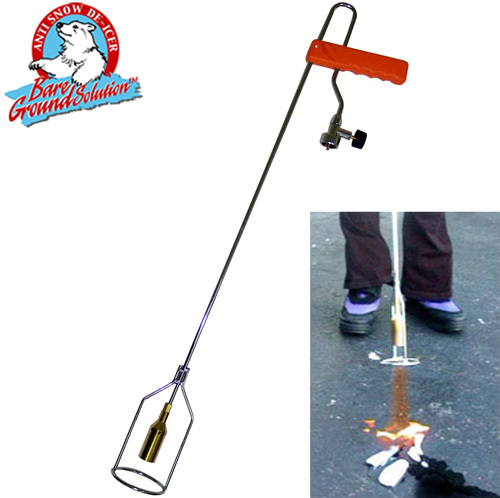 with the propane cylinder (not included), and uses either the 14 oz. or 26 oz. propane tanks which are available at most hardware stores. The Blaster has a full 31" reach so that you don't have to stoop and crouch. The flame control is adjustable. You'll get year round use for summer weed control - just aim and blast them away!